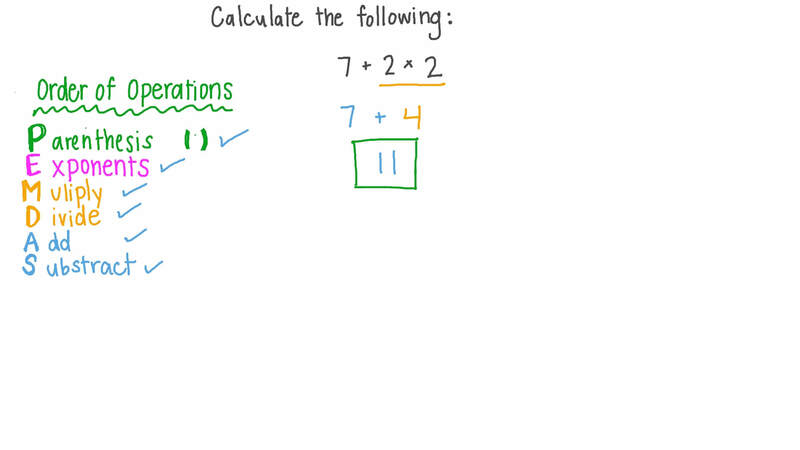 In this lesson, we will learn how to use the order of operations to evaluate simple numerical expressions. 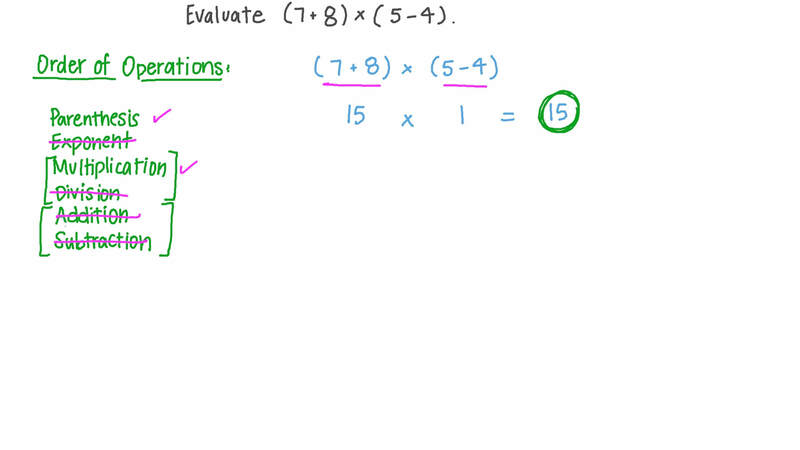 Evaluate ( 7 + 8 ) × ( 5 − 4 ) . 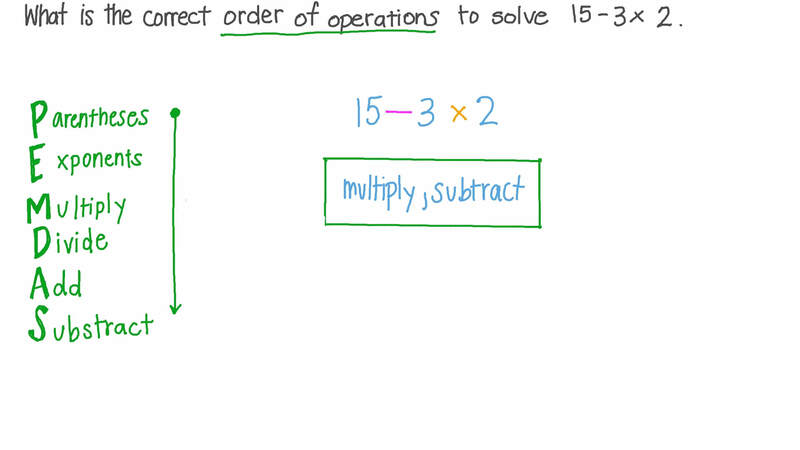 What is the correct order of operations to solve 1 5 − 3 × 2 ? Write an expression that matches this description: 23 more than the product of 19 and 5. Calculate the following: 7 + 2 × 2 . Calculate 1 5 ÷ ( 5 ÷ 3 ) . Evaluate 1 0 × 1 − 1 0 . Evaluate 2 × 1 − 1 . Calculate the following: 1 9 × 1 0 ÷ 2 . Calculate the following: 7 5 + ( 6 0 − 1 0 ) . The given table shows the cost of different snacks at a concession stand. How much would it cost to buy 6 juice pops and 5 sandwiches? Evaluate 8 4 ÷ 1 4 ÷ 3 . What number belongs in the blank? Hint: Think about the order that we do the operations. Think: about the order that we do the operations. Evaluate 4 − [ 1 3 + ( − 1 9 ) ] . Evaluate 3 × ( 1 + 4 ) . The operations are in the wrong order. Use the letters to list them in the correct order. Fill in the blank: When I add brackets to an expression, I will change its value. Which number makes the equation ( 8 + ) × 4 = 3 6 correct? Fill in the blank to make the equation correct: ( 8 − 2 ) × = 3 0 . Find the value of each expression. ( 8 + 4 ) ÷ 2 − 1 = . 8 + 4 ÷ ( 2 − 1 ) = . 8 + 4 ÷ 2 − 1 = . Fill in the blank: ( 1 0 − 2 ) ÷ = 4 .